Colin's shortish ride proved far more popular than Jim's jaunt. He had only three bikies for company on a great day for cyclists . . . a mere breeze, sunny, not too cold and a slightly wacky destination. That quickly became two when Howard punctured just outside Crondall and abandoned when he went flat again half-a-mile later. Where were the usual Sunday crowd? They missed Nature's Great Daffodil Show in its final days and woods sprouting their first bluebells. Then there were the odd human eccentrics thrown in . . . a bloke on a bike being sort of dragged along by his rather pathetic little mongrel on a lead and a really rural throwback guy with long grey beard, walking boots and a stick. The barn cafe is a joy, built nowhere near Churt. The trio made it just in time before 15 thirsty bikies showed up, including a tough-looking tattooed fat bloke who had to ride with his knees out to the sides. Warm enough to bask outside before returning home. Round trip: just short of 40. Great day, Jim! 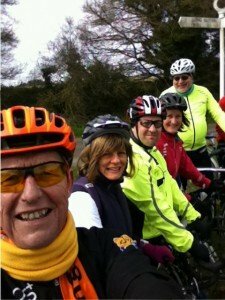 Meanwhile, Colin had six riders for the pedal2gether ride to Avenue Garden Centre at Lasham. Everyone enjoyed the hilly route and everyone managed the hills. Age range from 12 to 70! We picked up Howard just before our finish on his way home, see above, from the Pedal Heaven trial day. The image below is Colin's hopeless attempt at a selfie, missed the signpost, cut our Jenny and Nick. Anyway, from left to right, Colin, Helen, Chris, Fiona, Roman and a red arm of Jenny! Five of the seven pedal2gether riders and Jenny's elbow!